And It’s Not Even Friday (295/365) – Annoyingly Boring? The latest in my originally unplanned “inside” series. “Long time” visitors my recall my short run doing “Fridge Friday” photos, I had forgotten myself until I was discussing possibly shooting from inside the fridge with Bryan. Friday it’s not, but here’s a fridge shot. That fridge is way too freaking clean. How do you do that? oh, and i forgot to mention. 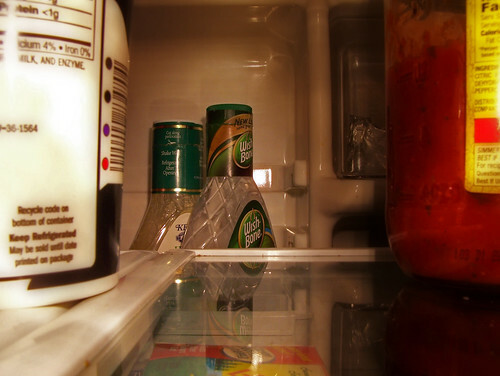 the shot was taken with the fridge door closed, the shot is lit by flashlight, but not ‘the’ flashlight. The “run” wasn’t short enough, apparently. Should wire the camera to take a photo when someone opens the fridge door. I will never take this shot. Nice work though, clean fridge and all.